Smith, Derek G.. "Shaman". The Canadian Encyclopedia, 16 November 2016, Historica Canada. 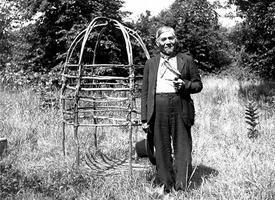 https://www.thecanadianencyclopedia.ca/en/article/shaman. Accessed 21 April 2019. 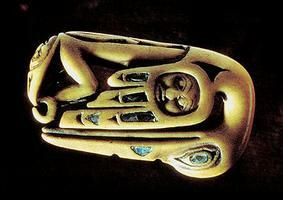 Shaman's charm, bone, Nass River, BC, Tsimshian (courtesy Provincial Museum of BC). A shaman is a religious or mystical expert (male or female) who, in traditional Aboriginal societies, functions as a healer, prophet and custodian of cultural tradition (see Aboriginal People: Religion). Shamans are the most notable of the multiple religious figures present in traditional Aboriginal religion. They function as healers, prophets, diviners and custodians of religious mythology. They are also often the coordinators of religious and cultural ceremonies, including the Sun Dance (a world-renewal ceremony) and the Winter Ceremony of the Kwakwaka’wakw, Nuu-chah-nulth and other Northwest Coast communities (see Aboriginal People: Northwest Coast). In some societies, all these functions are performed by the same person; in others, shamans are specialists. Healing practitioners may belong to various orders, such as the Midewiwin or Great Medicine Society of the Ojibwa, while other groups had secret or closed societies (Kwakwaka’wakw, Siksika). Members of such societies were not necessarily shamans, but did practice religious ceremonies and rituals. Shamans were associated with powers generally thought to be beneficial to the community, but were believed in some cases to use their powers for sorcery. Shaman-prophets and diviners were concerned with predicting the outcome of the hunt, relocating lost objects, and determining the root causes of communal discontent and ill will. 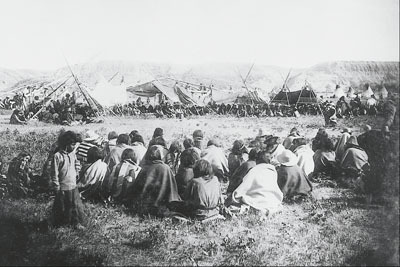 Siksika (Blackfoot), Cree, Ojibwa and other societies had diviners who made their prophecies (perhaps in trance states) in the dramatic Shaking Tent ceremony. Shamans in these societies were custodians of the sacred medicine bundles containing objects and materials endowed with great mystery and power. Innu shamans divined game trails by burning a caribou shoulder blade, then reading the cracks and fissures created by the fire. Shamans were often consulted at any time of sickness or communal misfortune. Natural causes were recognized for many diseases, especially physically curable ones; others were commonly believed to be the result of intrusion into the body of objects placed there by sorcerers. 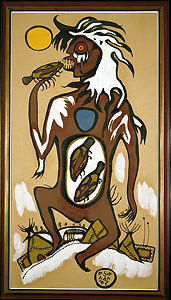 The shaman-healer’s treatment of such diseases was dictated by his guardian spirit, but usually consisted of the shaman ritually sucking the disease agent out of the body, brushing it off with a bird’s wing or drawing it out with dramatic gestures. Illness could also result from “spirit loss.” The shaman-healer’s action was then directed to recovering the patient’s spirit (either the soul or guardian spirit power, or both) and reintroducing it to the body. In 1880, the Indi­an Act was amended to prohibit the organization of, or participation in, certain traditional healing ceremonies, including smudging – a sacred cleansing ceremony that involves the burning of various medicinal plants. Some societies continued to practice their traditions in secret, while others upheld the prohibition in fear of government prosecution. In the early 1950s, the government lifted bans on traditional healing ceremonies. As Aboriginal peoples sought to reclaim traditions, Indigenous medicine began to re-emerge. 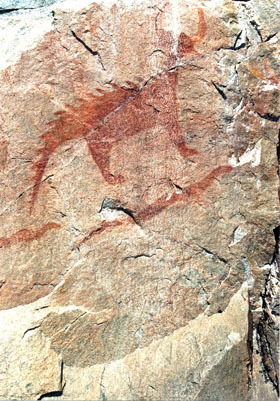 By the 1980s, various shamanistic rituals and healing ceremonies gained popularity both within and outside Aboriginal communities.The Department of National Health and Welfare Canada formally acknowledged “the relevance and the utility of traditional approaches” in a special report in 1983. Many shaman-led healing ceremonies are still performed, including smudging, sharing circles and healing circles. Most modern shamans see themselves as facilitators for healing rather than healers themselves. Shamans offer healing techniques for those suffering from emotional, mental and physical pain. Often, such techniques include connecting with spirit guides, negative energy extraction, holistic remedies, engaging with nature and spiritual cleanses. Similar to their ancestors, modern shamans also perform rites of passage ceremonies, including births, marriages and deaths.